I met Linda a little over a year ago when I sat across from her drinking coffee and discussing photography packages. I had the honor of photographing her and her husband's wedding last June, and it has been one of those client relationships that has come full circle. I noticed at her wedding that all her favors and invitations were made by hand and she had some beautiful art pieces to display as well, and I realized that Linda was an amazing artist. Ever since the wedding we have kept up with each other's creative happenings, so I am beyond thrilled to be featuring her today. If you have spent at least five minutes with her, you will quickly learn she has a kind and encouraging soul. Her care for people is directly reflected in each piece that she paints for people. When I got to her house this Saturday morning, she had coffee ready and we talked for about a half an hour before even taking out the camera. Not only does this girl have great taste in Netflix shows and herbal teas, but her taste in colors and art is absolutely stunning. Meet Linda everyone. How Did You Know You Wanted to Start This Particular Business? As a beginning teacher, I felt that I was struggling to find my identity. I felt like I was constantly treading water trying to learn and teach. Although I love teaching science, I felt that I needed something that allowed me space to be creative. Painting and drawing allowed me to lean into a practice that calming, and that helped me reflect on places, people and memories. When I painted a church for a friend’s wedding, I knew that I only wanted to help people reflect on happy memories as often as possible. What Makes You Stand Out Among Other Businesses? My watercolor paintings are a reflection of a memory; I love using bright, warm colors and impressionistic brush strokes to help my clients remember that special place or memory. It is not quite realistic or stylized because I feel that memories are also somewhere in between. Because I love nature, I love to focus on trees, landscapes and skies, and am constantly challenging myself to experiment and find new combinations of brushstrokes and colors. How Do You Identify Weaknesses in Your Craft and Business? What Do You Do To Lean Into Your Weaknesses and Challenge Yourself? I still practice basic skills in a sketchbook I have, such as value and color mixing, but to truly challenge myself, I try to paint a fish or work on my National Parks series. Fish are incredibly challenging to paint because their colors are nearly iridescent and seem to change with the slightest change in light. The National Parks series I am working on tests my attention to detail and timing, and I love painting in a small space. What Is Your Busiest Season? How Do You Balance It All? I reflect often on how many paintings I am able to undertake and if it is overwhelming or not. Because I work full-time as a high school science teacher, I have to manage my time well, especially around the busy holiday or wedding seasons. From October to late November, I typically take 2-3 times as many orders as I normally would during that same two month time period. I put myself on a schedule and then put on some music to focus on days that I paint after school. What is Your Favorite Project or Piece That You Have Made or Currently Selling? 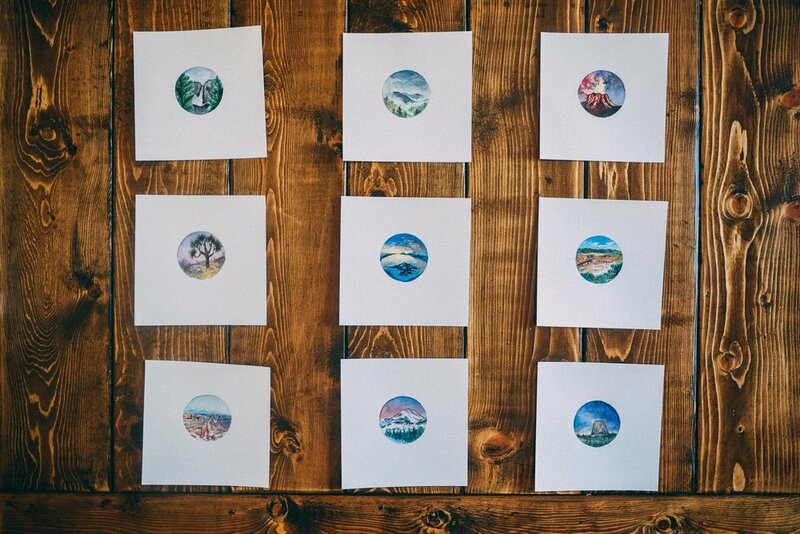 I am in love with my National Parks series, which is not currently for sale. They let me venture into small worlds they hold. Recently, I have loved the Timeline Portraits - they are similar to the National Parks in structure (a small circle watercolor painting), but I love how they showcase a relationship and its special moments in a very different way. Describe Your Office Space and what Your Most Productive Time to Work. My office space is my dining table because I have the best morning light and view. My backyard is mostly grass and trees, and I can hear birds singing through the windows. It is incredibly peaceful in the morning. Saturday mornings from 5am or 6am to about 10am is when I am usually the most focused and productive. What's the Most Tedious but Necessary Task in Owning Your Business? To be honest, I would have to say social media marketing. I was late to the smartphone and devices game because I’m old fashioned and still love books and waiting in line at the post office. I also hate being on my phone. I try to compress my time and take several pictures for Instagram and save the posts as drafts, or schedule posts on Facebook. My primary and favorite way of marketing is Instagram, because it is so visual and real-time. What Drew You To Working with Water Colors? What Inspires Your Creations? Watercolors are not as forgiving as other mediums, such as acrylic or oil. I loved the softness of the images created by watercolors, and how I had to learn to lose a little control when working with them. You really have to work with the water and pigments, and learn how to marry both without using too much of one. I am truly inspired by nature and how it interacts with us - shadows falling on a lawn, the reflection of trees in a window - you’ll see a lot of green, blues and yellows in most of my work. I have a set number of commissions per month (between 4-6) that I try to reach. This allows me to meet my costs and continue purchase of materials for new projects. Beyond that, I try to meet my personal project goals, such as the National Parks series. I would love to complete an acrylic series this year also. What Piece of Advice Would You Give to Someone Just Starting Their Small Business? I would say your small business should be a reflection of you. I feel that every painting or piece of writing I complete for clients has a little bit of my heart in it and is an authentic representation of my style and my personality. It is very difficult if you are trying to emulate or imitate something that isn’t you. In honor of Mother's Day, Linda is offering 15% off all water color orders. The promo code is COPPERBOOM. And the first three people who can guess where the code is from will get 25% off. Comment below!